I am so very flattered that someone remembered The Trapezee Capers Show. It was really kind of ahead of its time. Sort of a Soupy Sales meets P Diddy & Lil' Kim. Mahcoe Van Dyke (later of Mahcoe's Scene on KOTV) was a frequent co-host. (I believe he later drove through Clayton's Vaughn's office at KOTV with a newscar, via the brick wall). Kangarooney was a faithful sidekick and yes, he did blow bubbles but it wasn't from his pouch!!! As for Chortles the Dingo Dog, he passed on many years ago after ingesting a bad batch of Ol'Roy. Had him stuffed by a talented taxidermist and he still makes appearances at store openings and an occasional county fair. That was one of his offspring that was auctioned at the recent Wanamaker Show. Thanks for the memories. So we do have another star in our midst! Favorite Tulsa TV show or personality: ¿? Well I think Hanson is so cool!!!!! I love Hanson especially Taylor, I know they came here and I hope they come again to here and read this comment. And I want somebody e-mail me please!!!!! Fatima, I hope Hanson is (are) reading this, and you get your wish! The Hanson signing occurred in Guestbook 22. Favorite Tulsa TV show or personality: Poor ole Pappy.. Does anyone remember the little town Ike Horn took over to make furniture in? In the pre-NAFTA days, someone told us he basically put a furniture factory in some small dying town in OK or western AR to build his sofas ("Use more foam, Maybelle! "), ScotchGuard them and make rough "woodsy" pine frames ("them beavers ain't pullin' their load, cuttin' stuff down!") furniture in. Maybe this is where the infamous "HOME PACKS" came from? By the way - it wasn't till I came to Tulsey that I heard of furniture grouped in suits - or was that - suites - in TV/radio ads. Hello, Frank Tutt! Legit furniture salesman or Ike Horn in a better "suite" of clothes??? Claude Riggs and Frank Tutt...an earlier generation of furniture sellers. I don't think the dapper Mr. Lawhon ever hosted a music show; that was probably the Horn Bros. show. In the late 60's I was on the Mr. Zing and Tuffy Show and got an American flag. And I still have this flag and fly it. Does anyone know where we can get a picture of Mr. Zing and the gang??? How about Lee and Lionel??? I really want these to have for my office wall. It really brings back memories for all when you talk about KING LIONEL. Warren, you could print the pictures from this web site on high quality paper...I don't know of any other source at this date. hey Tulsa.....there are a lot of great places to remember and of course if you were born in the late forties you grew up right with the T.V. shows...I was wondering if anyone remembered the Denise Lundy Trappezee Capers show which came on late nights I think Channel Two KVOO...she had this puppet named Kangarooney that blew bubbles out of its pouch and a side kick named Chortles the Dingo Dog...it was a cool show and in retrospect it reminded me of the Tom Robbins book Jitterbug Perfume...where are all these people....someone told me Chortles the Dingo dog was auctioned off at a gun show a couple of weeks ago...if anyone knows about the show let me know...happy Tulsa Trails.. If you look at the page Mike posted, the station is licensed by The Box. In case you aren't familiar (most aren't, I'm sure...thankfully), The Box is a 24-hour, viewer controlled music video station. Similar to MTV, VH-1 et al, but you can call a 1-900 number and spend 2 bucks to get a video played. This network can currently be seen in Tulsa on UHF 25. Channel 25, whose calls are KLOT, was originally an affiliate of the America One network (some may know it as Channel America). In fact, Sam Jones' most recent call-in show spent a few weeks on this station in '97. Gary Shore was a regular on this incarnation of the program. I have a feeling that 25 will either go back to the America One network, or perhaps will upgrade to a full-power station. The FCC database shows that KLOT has applied for a construction permit. So, to confuse us more, it appears that channel 25 should be the one to watch for. Okay, I also have more "where was it?" questions. 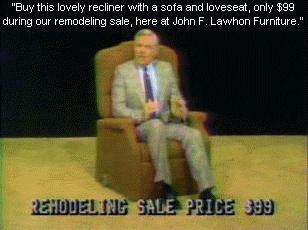 The photo on the main page is a still from a John F. Lawhon Furniture ad. Where was this store located? When did it close down? And the dire question, how exactly is Lawhon pronounced?!? Wasn't it on Pine between Memorial and Sheridan? It is pronounced Law'-hahn. Thanks very much for directing me to your site .... today I finally got a few minutes free to go and take a look around and --- wow! This stuff gives me goosebumps! It brings back so, so many memories from my childhood. As I think I mentioned in the piece you apparently saw at my own site (where I referenced Mazeppa - I assume that's how you found me) I was born in Tulsa but we moved when I was still an infant to Arkansas, a small town called Siloam Springs located just across the Okla/Ark border. This was late 60's/early 70's when there were still not many tv stations, at least not in our little town. 'KTUL-TV, Channel 8, Tulsa, Oklahoma' -- I can't ever think of just 'Channel 8' or 'KTUL,' it's always the entire phrase in my head, drilled there from those ubiquitous station-ID voiceovers between shows -- was the mainstay in our house during my entire childhood. I remember so fondly not just Mazeppa, but John Chick (whom my mother took us girls to meet - we got autographs) and his 'Mr. Zing' show, and later the Uncle Zeb show ... these all figure so prominently and so happily in my memories. I even loved the news! I used to have a very major crush on Bob Hower (hubba! ), and loved Don Woods' weather spots, especially when he drew his 'Gusty' picture each night to give away to some lucky viewing kid. I'd love to have a Gusty picture, never having gotten one back then. It's funny, but I realize now at the ripe old age of 36 that some of these tv personalities helped shape my perception and even some of my preferences... I guess that's how it works for all of us, but it's just a little startling to realize it so consciously while staring at their faces again for the first time in 25 years or so. The John F. Lawhon commercial picture on your opening page made me actually gasp, like something out of The Twilight Zone - I had totally forgotten those, but when I saw it they all came rushing back. I can still remember his voice. And how about those Shawnee baking product commercials - 'It's as easy as 1-2-3, and Shawnee adds the [pause] 'me'!' ... hah! Thanks for the delightful note, Linda! I discovered Linda's musings on Mazeppa while searching the internet, and sent her a note about this site. 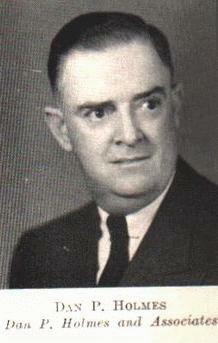 That picture of John F. Lawhon looks as if it were taken in the Twilight Zone, a topic which has arisen here previously, near the bottom of Guestbook 44. The Shawnee jingle has insinuated its way onto this site, also, to the consternation of many. You, too, can own your own Gusty...visit the Weather page on this site and take the link to Don's web page! That music store you guys refer to is "Roy and Candy's". They were at 21st & Memorial for years and have since moved to 61st and Mingo (in Alsuma U.S.A. by golly). I believe Roy Ferguson and Candy Noe were regulars on the Longhorn Wingding, but I'm not sure. They still do live ad spots over KVOO (Big Country 1170 by golly). They are some nice folks. I do remember Candy Noe on the Horn Bros. show, along with Pam Van Dyke, who is active in the Tulsa Jazz Society today. Scroll back down and take another look at Steve Todoroff's note...there is a now a picture of that Leon McAuliffe album he spoke of. Oh, yeah, Claude Riggs! I think that is the 1st time he has been mentioned! I didn't realize the Hank Thompson show was done at 8, or maybe just didn't remember. Buck Owens did his rhinestone and wagonwheel "Ranch Show" at WKY for a long time. Buck was no fool (owned several radio stations, most of which I think he sold for gazillions) and kept ownership of the show, so those old tapes are with him in Bakersfield, I guess. I saw some of those old shows about 15 years ago in glorious low-band 2" color. Sharkskin suits in colors not known to nature with artful ornamentation by "Nudie" Cohen, but great music, particularly when the late Don Rich would chime in on harmony. I heard tell that Buck and Roy didn't much get along on the set of Hee Haw--Buck, I always heard, had a pretty short fuse, and tended to be sort of aloof. Maybe Mr. Sartain can confirm or refute. Hank Thompson, during my Tulsa tenure, taught a course in country music at Claremore Jr. College. That would be cool--a curriculum of Hank, Buck, Bob and Johnnie Lee, and Leon and lesson charts of Merle Haggard's ex-wives. Also during my Tulsa years, Leon McAuliffe and the Cimmaron Boys played about every weekend somewhere, generally the Caravan Ballroom. Brain stretcher...what was the music store over there 'round 11th and Memorial? Somebody and Somebody's, but I can't pull up the names. I believe Porter Wagoner did his clothes shopping at Nudie's, too. Hey, I wrote in last week about a new tv station coming to Tulsa. I thought I made a mistake with the channel # but I looked in a tv data base site (it's late at night, I'm bored, sue me.) Anyways, it is going to be channel 51 KOPE and yeah, it's a low power tv station.So, I guess that will mean Cox cable won't carry it. Here is a database that backs James up: http://personal.bna.bellsouth.net/bna/w/9/w9wi/stmapok.htm. But here is one that says it is in Des Moines: http://davidtanny.8m.com/03ftusia.htm. Which is right? The 1st one is more up-to-date. Web site: The Walrus Was Crow Beatles Page! Favorite Tulsa TV show or personality: The gentleman who did the Buffalo Fine Jewelry commercials. Well, you can look upon this as Jerry Pippin's show going down hill for sure if you want, but I'll be on the show Sept. 21st, talkin' Beatles, Muskogee, and whatever else, maybe a few rare tracks. Hope I can count on all you ex- Muskogee-uns to be there! Thanks! David, we'll get a notice up on the Bulletin Board! Jim Reid's story reminded me of a similar instance with a faded country star when 8 was doing "The Hank Thompson Show" - I forget with whom - they brought in 1 or 2 33 new rpm records to lip sync to and all the cuts were unusable, so the guest just chatted with Hank. The only place I ever saw that show - was on 6 and much later on OETA. My biggest thrill of that show was drooling over Roy Clark's Ovation guitar - then the new rage in gitboxes. Roy was in on a Sunday and sat in the empty 8 newsroom and just picked some. He IS a great guitarist. With the shot posted here of 8's 1st floor newsroom with Mike Miller and Jeff Rosser typing away-for a reference - I can still picture him sitting by the window at the chair next Rosser's/Hower's desk - playing the guitar. Sweet! I previously entered a yarn about Jesse Ashlock, the former fiddler and occasional singer and songwriter in the Bob Wills band, and the music program we did on KTUL in 1954. He related a story about a Wills recording session in California. During the first take of the first song, Wills came out with his famous call, Ahhhhh-Hawww. The arrogant producer of the record came out into the studio, called a halt to the music, and asked what that strange call was. Wills explained. The expert replied that it was a dumb thing to do, and ordered Bob not to use it in the recording session. Frank's previous story is the 8th item down in Guestbook 33. Frank just emailed me a picture of Dan P. Holmes, Sr. At the end of his TV ads in the 60s and 70s, Mr. Holmes invariably made an impassioned plea to get Highway 33 fixed. He had business interests in Arkansas, which kept him in touch with the poor quality of the road. He finally got his wish, and the new road is named after him. Mike was talking about Huck commenting on the quality of music on the Chick show. Of course to get on the show, you had to go through the rigorous test of actually showing up. One morning an older woman came in to sing one song. She was pretty proud of that song and had even made a 45rpm record of herself doing it. Since she had paid to get the record done, she wanted to lip-sync to it. They ran the record up to B audio and John intro'd her and they rolled the record and she began to sing. Well, closest thing I'd heard to that song was when two cats got into a really nasty fight outside my window. Having heard enough, Huck got on the production page and said "get this woman off, she's terrible!". Unfortunately, since she was lip-syncing, no mics were open and the speakers were not muted in the studio. The woman stopped, (the record continued) and started looking up like she had been spoken to by God. That kind of morning wasn't unusual on the Chick show. As ex-KTULers from the 70's can testify - the late Huck West would say on headset, "Take it away, Leon!" when the Chick Show had a band that was rockin'. But for years - I thought he was talking about Engineering Supervisor Leon Holland doing a jig or gettin' down to the music. Leon might do that - if a "toe tapper". Till someone enlightened me - it was a line stolen from Bob Wills (now my patron saint in music)! Oh, yeah, Huck would also "Wooooo!" if the music was really cookin'! Here's a "Wooooooo!" for you, Huck, we all still miss ya! 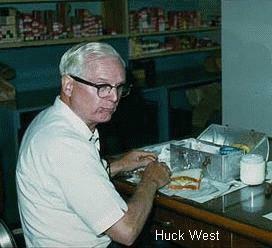 Here's another story on this site about Huck West. Favorite Tulsa TV show or personality: Mazeppa, of course! I don't have any local stories about the late Leon McAuliffe, but I do have a story about Leon and another Leon from Tulsa working together in Los Angeles. "Leon Russell did play on one of my sessions, a song called I Fall To Pieces on the Capitol Records instrumental album [Dancinest Band Around] I produced. He came up to me after one song and said, 'Im not playing the style of piano that you need for this record. Ive heard some of your piano players and I cant play like that.' We got Billy Livert from Nashville to play on the rest of the sessions, but I always admired Leon for what he did that day." I wish now I'd taken more time visiting with Leon McAuliffe. I'm sure he had a million stories to tell! Since Leon Russell's real name is Russell Bridges, I have wondered if he borrowed the name "Leon" from Leon McAuliffe. Do you know, Steve?...Steve replied via email: "Leon actually took the name from a fake ID he was using." More about that in Steve's upcoming book about Leon. Steve sent a picture of the album he was talking about. 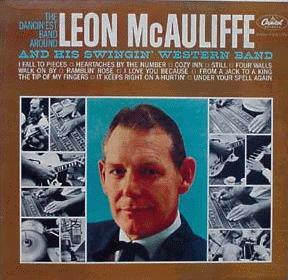 Being a steel guitar player, I've heard many things come up about "Take It Away" Leon McAuliffe. I know he had been on radio and TV here. Anybody out there have any stories concerning those broadcasts? Frank Morrow and Al Clauser are absolutely right--Andres Segovia is the world's greatest guitarist. However, Roy Clark occasionally will attempt classical guitar with good results. Don, did you check out the pictures of your old Pilotuner at the bottom of Guestbook 51? The Capri Drive-in Theater was at 7600 West Charles Page in Sand Springs. It is now a "Pull-A-Part" auto salvage. A few years back Pull-A-Part had a radio spot that referred to the location as "the old Capri Drive-in". Regarding the early days of stereo radio. I recall as a kid in Kansas City, about 1960, there were occasions when a TV station would broadcast some special event, say a concert, and the left channel was through the TV set, while the right channel was available on an FM radio station. I also remember at least one occasion when some special events were fed with one channel on an AM station and the other channel on an FM station. That didn't last very long, but I distinctly remember it as a precursor to stereo. Also, as recently as about 1986 it was a big deal to watch some live concert (on HBO, MTV, etc) and have the stereo simulcast on the radio. I remember a TV/FM simulcast of Ella Fitzgerald from the Performing Arts Center in about 1978-79, maybe PAC's debut act. I know that the Riverside was at about 71st and Trenton, and I know where the Admiral Twin is, but where was the Capri? Back to oldtimers: One of the best announcers to come out of Tulsa was Bill Fountain, who moved to Chicago and for years was a leading commercial spokesman for various firms, most notably a Michigan Avenue furniture company. He suffered from a deteriorating health condition and I don't know what happened to him. His sister, Ann Fountain, was a gorgeous, tall, brunette who worked at KOME radio in the late forties. Don't know what became of her, either. Does anybody have additional info? I've done some searching and struck out so far...but I sent a query to Rich Samuels, who has an excellent web site about Chicago broadcasting that Mike Bruchas discovered back in Guestbook 6: http://www.mcs.net/~richsam/. We'll see what Mr. Samuels has to say. Speaking of Chicago TV, Irv Kupcinet's Chicago-based syndicated talk show was seen in Tulsa for awhile in the 60's. Radio guys - remember discrete and SQ stereo for surround sound? I guess it died because there were 2 standards and I think the various FM stations in Tulsa used one OR the other, not both. I had a Radio Shack "de-coder" amp for this and I think SEVCO sold Sansui tuners that coped with it. I see surround sound is back for home theatre applications. And how 'bout them 4-track decks? Bought one used back then, and the only tape I had for it was Jimmy Gilmer and the Fireballs doing "Sugar Shack" (somewhat shakily due to the horrendous wow and flutter). I wish that they could have broadcast the soundtrack on FM when I was growing up. I could sit in my backyard at the bottom of Cinncinati Hill and see the screen of the Skyline Drive-In, I just couldn't hear it. That was back when the Capri and many others had playgrounds that included motorized rides, many that were built, I understand, out of salvaged WWII bombers by Bob Bell (Bell's Amusement Park). Hey Ransom, here's a little warning about the Admiral Twin. I was out there in July to see 'Shaft', and the guys running the concession stand are a couple of grade A punks. I got some nachos, and one of them was not very generous with the simulated cheese! A nice cool breeze was blowing last night...perfect drive-in weather. We arrived late and headed for the concession stand. When we asked a worker what had happened in the movie so far, she shrugged, but another patron in line filled us in. Luckily, she wasn't parsimonious with the cheese food product. The sound quality is better these days. No more speakers hanging in your window, although the old poles are still there. The soundtrack is at 88.3 FM for the East screen, 88.5 for the West. See if you can tune them in next time you buzz by on the Crosstown Expressway. Nice supporting role for Gailard Sartain in "The Replacements". I hope there weren't too many takes for the scene where he gets a jug of Gatorade dumped on his head! Favorite Tulsa TV show or personality: Answering webmaster about Capri. It is torn down now. By the time I got there (1971), there was no train and no playground, since it was then an adult film venue. The picture you see on the Drive-In page was a B & W photo taken in the 80s when the Capri was boarded up and gone further to seed. I used some digital tricks to restore it to its former glory. Hey, Gailard Sartain's most recent movie, "The Replacements", is playing at the Admiral Twin right now...I plan to make it out there this weekend! How did you find TTM? It is part of my daily diet. I enjoy the contributors to this book taking time to chase rabbits once in awhile but it is always good to get back to the topic of vintage Tulsa media. Does anyone remember radio personality Mary in the Morning? She was on the air for a short time in '76 or so. She had a fabulous voice but she couldn't hit the right button on the console if some held a gun to her head. I believe that is why her career was short-lived, maybe not. Lowell can be seen in his AMX in the previous Guestbook (#51). Just archived Guestbook 51; this is #52.